Green public transportation-an attitude and a responsibility! Green public transportation refers to means of public transportation not using gasoline or diesel engines. Pure electric bus is the most representative form of green public transportation. It is an attitude, but also a responsibility. Pure electric buses help reduce carbon dioxide emission and air pollution. One inner conbustion engine powered bus can emit 17.8 tons of carbon dioxide per year and China has about 500,000 of them. If all of them are converted to pure electric buses, an annual reduction of 8.9 million tons of carbon dioxide emission could be achieved. Vehicle exhaust fumes are a major source of urban air pollution and help cause the heat island effect in urban areas. Exaust fumes heavily pollute air in the space extending to a height of two meters above ground and cause lots of noise, thus seriously threatening people's health. Hybrid Kinetic Group's pure electric buses will help improve urban environment, reduced air pollution, and reduce carbon footprint of cities. The HK eBus 12 meter one-step-low-entrance model is based on the German MAN technology with elegant design and a comfortable ride. It carries onboard the HK super battery that boasts long cycle life and ten minute fast charging capability. So far it is one of the very few commercially feasible pure electric bus in the market with long service life that can be quick charged/discharged. The battery packs are located atop the roof and under the rear theater seats and don't take up any internal passanger space. The container of battery packs comform to the stringent IP67 standard. Vehicle wading depth is more than 700 millimeters. The HK super battery can be quick charged. Capacity of battery packs onboard the bus can be customized according to conditions of different bus routes. The charger can work under high voltage at 750V and high current at 500A. Ten minutes of quick top-off charging can ensure a range of 45 kilometers. The HK eBus is most suitable for urban public transportation usage. It outperforms the gas or fuel vehicles in terms of energy efficiency and cost effectiveness. During coasting and braking, the motor can automatically convert to generator mode, recovering the kinetic energy to charge the battery. 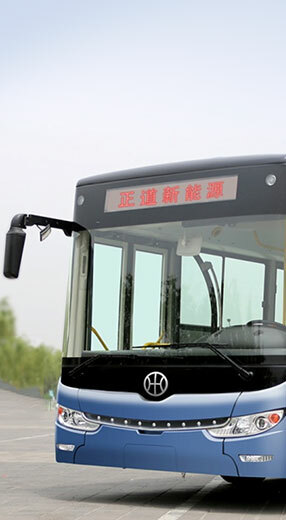 The eBus electric motor uses highly efficient permanent magnets and outer-rotor technology to minimize the amount of permanent magnetic material used. The motor generates high torque at low rpm and can be directly connected to the conventional drive shaft differential without the need of intermediate transmission. The drivetrain is thus simplified and the the whole system more reliable, economic and efficient. Charging stations can be placed in bus terminals and transfer stations. Buses can be quick charged during terminal stops. Vehicles carry only 70kWh of batteries, enough for one-way or round-trip need. Compared with other electric buses that carry 300kWh of batteries, both the cost and weight are greatly reduced. HK eBus features a user-friendly, spacious and comfortable cabin design. Buses are eqipped with air conditioner that work from -30 ℃ to 55 ℃, satisfying the needs of cold and hot areas alike. The HK eBus presents passangers a quiet cabin without the engine and exhaust noise. With 1.25 meter wide passenger doors and 340-370 millemeter one step ground clearance, getting on and off the bus is a breeze. HK Group has a professional R&D team with rich experience in product development, original ideas and keen market insight, who aim to deliver customers satisfactory products. It also aims to constantly upgrade the products and expand the product lines to meet demands of customers and the market. HK Group is dedicated to contribute to green transportation. · Highest Safety: LTO batteries are recognized as the safest lithium-ion batteries due to the stable structure of lithium titanate oxide. Puncture safe. · High-power, high-torque motor provides ample power for the vehicle in a variety of road conditions and operating modes. · Motor system employs advanced technology. Motor systems are assembled domestically with imported major components. · Motor is connected directly to the drive axle, eliminating gearbox and other speed reduction mechanism that not just cause noise and oil leaks but slao require maintainance, making the ride more smooth and vehicle more reliable. · Intelligent temperature management: electronic fan cooling system provides forced air cooling for the motor and control box. · Equipped with automatic temperature detection system that initiates lowered power operation and sends alarm in high temperature, and other security functions to prevent negative effects due to thermo concentration. · Motor controller uses RS 485/232 and CAN communication for data exchange with strong electric controller and vehicle controller to achieve coordinated control so as to guarantee system realiability. · Motor controllers verified by VCA (UK Vehicle Certification Agency). European developed BMS collects real time working status data of each cell and passes such data and control policy to the vehicle controller in order to achieve optimal management of the cell. Cell voltage can be precisely controlled to ± 2mV. Optimal charge algorithm by discharge control (energy prediction) ensures charge balance, increases energy, shortens charging time, and extends battery life. Application interface and diagnostic management functions are also included. A battery module is a physical unit of multiple cells connected in series or in parallel. Modules are basic units of HK battery systems. A battery pack is made with multiple modules in a container designed for specific vehicles. Each module is equipped with voltage and temperature acquisition device, which monitors the real time status of cells in the module. Module design takes into consideration the heat generated during charging and discharging of cells. Each cell has a cooling fin to disperse the heat. · High standard container/case with 10 year guarantee. HK Group has set up a battery technology R&D team of world's leading experts from US and China. At the same time, HK Group has set up a battery technology company in Lianyungang, Jiangsu Province, assembling battery modules and packs for electric buses and other EVs. Class 10,000 cleanroom, 10% humidity. Quality inspection throughout the process, including ubiquitous visual inspection and various thickness/size verification. Accurate coating control at ±3µm. Accurate control of cell capacity, open circuit voltage, internal resistance and cell classification. Comprising: a cell sub-assembly line; a cooling fin sub-assembly line; a module assembly line; two module+PDU assembly lines; module/battery pack cycle life test post. World's best ultrasonic welding equipment guarantees the quality of tab welding, which is the most important process in battery module manufacturing. Automatic ultrasonic welding head movement guarantees consistency and quality. Detailed inspection standards are made for raw material acceptance, production process, and final products inspection to guarantee quality. Inspections happen at all stages from cells to modules to packs, and cover the performance and safety elements in order to guarantee quality from beginning to end. 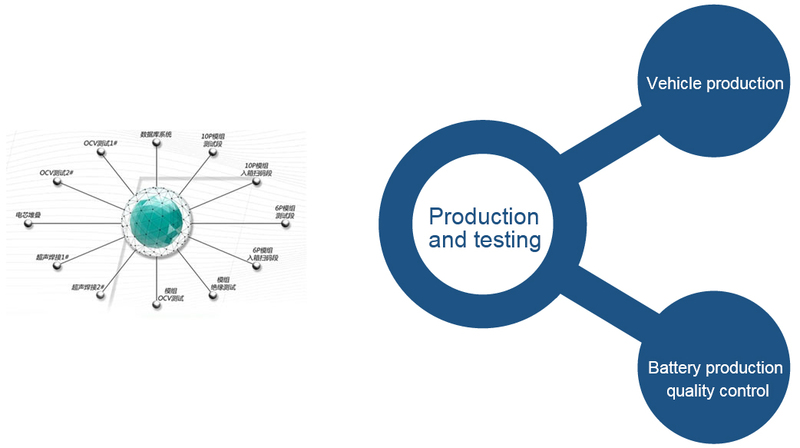 Manufacturing Execution System (MES) is applied to meet the production and quality data collection, control and traceability requirements along the whole production process. HK Group will consolidate manufacturing capacity all over the country. Besides strictly controlling the production process and material quality, taking advantage of the plants' technical superiority, it will also dispatch experienced production managers and technical experts to the plants and contribute its expertise in production and management. Such a multiple-win solution will guarantee quality consistency, improve the plants' capabilities, and reduce capital investment. The light-asset operation mode will also help release the idle or spare production capacity. HK Group will consolidate resources and capacity of manufacturing plants all over the country and work with local public transportation companies to promote clean energy buses and help the local governments realize the dream of green transportation. HK Group will help local businesses maximize their assets by means of equity investment and work together with them to achieve steady growth in the clean energy bus industry. HK Group will work with local public transportation companies through financial leasing service so that they could acquire our buses at best cost and have access to the optimal green transportation solution. The HK eBus carries onboard the HK super battery that boasts long cycle life and ten minute fast charging capability. So far it is one of the very few commercially feasible pure electric bus in the market with long service life that can be quick charged/discharged. Vehicle life is guaranteed for 10 years, and HK super batteries are guaranteed for 10 years of worry free use.